***AMAZING VIEW LOT IN GANESHA HILLS, TRUELY A UNIQUE NEIGHBORHOOD, SURROUNDED BY CUSTOM HOMES BUILT FROM 1923 TO CURRENT. THE LOT IS LOCATED WEST OF 1000 HILLCREST DRIVE. 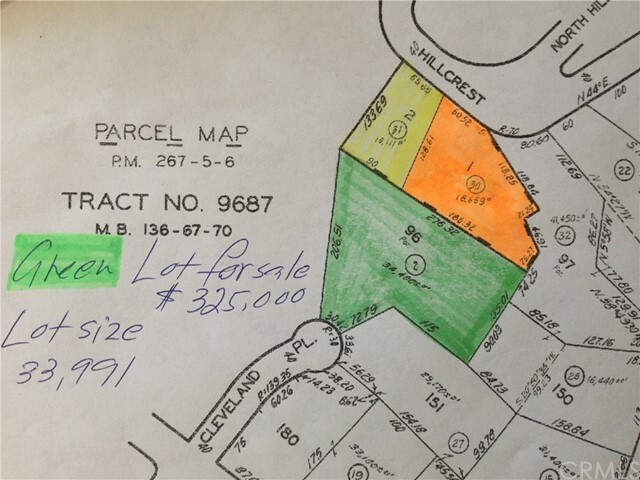 *** ON THE PICTURE, THE LOT IS LEFT OF THE HOME***. (the home at 1000 hillcrest is for sale as well, coming soon). ***THE BELOW, WITH CLEVELAND ACCESS IS FOR SALE AS WELL. ***VERY CLOSE TO 57,60,10 & 210 FREEWAYS. ***CLOSE TO LA COUNTY FAIRGROUNDS,CAL POLY POMONA, MOUNT SAC COLLEGE, LA VERNE UNIVERSITY, RAGING WATERS,MOUNTAIN MEADOWS GOLF COURSE, BRAKET PRIVATE AIRPORT AND MANY MORE. ***PLEASE CHECK WITH CITY OF POMONA REGARDING BUILDING REQUIREMENTS. ANY FURTHER QUESTIONS, PLEASE CONTACT LISTING AGENT RONA.